The metropolitan city of Kolkata is famous for its vibrant cultural history and ethnicity. Kolkata, popularly known as the City of Joy, is the hub of innumerable temples, many of which are extensive pilgrimage sites. According to scriptures, there are over 33 crore deities, who are worshipped in Hindu religion and temples in Kolkata house almost half of these deities. Each of these temples are unique in their own way and have a rich history of divinity. 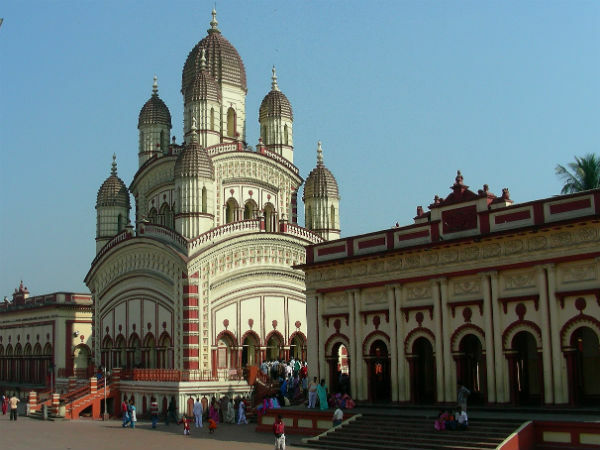 Here is a list of top 10 famous temples in Kolkata that attract devotees in large numbers. Kalighat Temple, which is dedicated to Goddess Kali, is regarded as one of the 51 Shakti Peeths of India. People believe that the idol at the 200-year-old Hindu temple is the most vibrant and lively idols of Goddess Kali of all time. Everyday, the jostling temple, located right in the middle of the City of Joy, attracts a humongous crowd, including pilgrims and tourists, who offer puja to Goddess Kali. In 1996, Birla family constructed the Birla Mandir to worship Lord Krishna and Radha. However, there are other deities as well who are worshipped in this temple. The elegant architecture of the Birla Mandir is hugely inspired by the Lingaraj Temple, which is located in Bhubaneswar. Lake Kalibari was established by Haripada Chakraborty in 1949 and the temple worships another form of Goddess Kali known as Goddess Karunamoyee. Although people call this temple Lake Kalibari, the official name of this temple is Sree Sree 108 Karunamoyee Kalimata Mandir. When the entire country is fighting about religion, here is a small part in Kolkata which shows that religion is not a hindrance at all. Goddess Kali is a Hindu god, but the Chinese Kali Temple in Kolkata worships Goddess Kali following the Chinese rituals. The temple is run by Chinese priests and they offer noodles or chopsuey as prasad to the goddess. The incense sticks are also very different from what we commonly see in Hindu temples. Is it difficult to believe? Then you must visit this place to experience this yourself. Built in 1912, Agni Mandir worships Fire God and is the centre of the Parsi traditions in Kolkata. On the top floor of the temple, there is a guarded place where the eternal fire burns constantly throughout the day. However, this place is not accessible for the public. But, the temple authorities have displayed a holy image of the burning flame on the first floor of the temple for the visitors or pilgrims. Thanthania Kalibari, dedicated to Mata Siddheshwari (one of the forms of Goddess Durga), is one of the oldest temples in Kolkata. Every year, the image of Goddess Kali, which is made of clay, is replaced by a new one. Built in 1803 by Shankar Ghosh, Thanthania Kalibari attracts a huge number of devotees everyday from different parts of the country. Rai Badridas Bahadoor Mookim founded this Jain temple in the year 1867 to worship Pareshnath, the 23rd Jain tirthankar. Calcutta Jain Temple is also known as Parshwanath Temple. Apart from Pareshnath, this temple also worships four other holy preachers, who are regarded as Avatars by the Jains. Throughout the year, devout Jains visit this temple and offer prayers. Established in the year 1970, ISKCON Temple is one of the most popular religious centres in Kolkata that worship Lord Krishna and Radha. The temple, also known as Sri Sri Radha Govinda Mandir, organises several religious activities to engage with its devotees throughout the year. Sri Bal Hanuman Mandir is dedicated to Lord Hanuman, who is the symbol of energy and strength, and receives countless devotees throughout the year. Apart from Hindus, this temples also attracts the Jain and Buddhist devotees as Lord Hanuman is quite popular in those two religions as well. Located atBelghoria, Kolkata, the Sri Sri Iswar Madan Mohan Jew Temple is a beautiful temple that one could visit while in Kolkata. The interiors of the temple are artistically designed and beautifully decorated with several paintings, murals & studdedwith precious and semi-precious gems and stones. Established on February 23, 1829, the temple is dedicated to Lord Krishna and Radha. Shirdi Sai Baba Temple was established in Kolkata in the year 2013 for all the devotees of Shirdi Sai Baba. Previously, there was no temple dedicated to the famous Shirdi Sai Baba. But, now plenty of Sai Baba followers visit this temple daily and offer prayers.